Paul Rogers has collaborated with Puppet Theatre Director Matt Smith on this performance based work. It mixes noise, object, theatre and puppetry in a semi-improvised burst of sound and image. Both Paul and Matt are exploring the world of ‘Junk’ in their respective fields, and this show builds soundscapes, instruments, puppets, objects and conceptual themes from the abandoned and the pollutive aspects of Transport and Travel. Junk Instruments are used for the acoustic qualities but are also transformed electronically to create new and idiosyncratic methods of sound performance. Abandoned objects are used as props and functional items in the show. Puppets, lighting objects and other performative materials are constructed from the detritus of society. 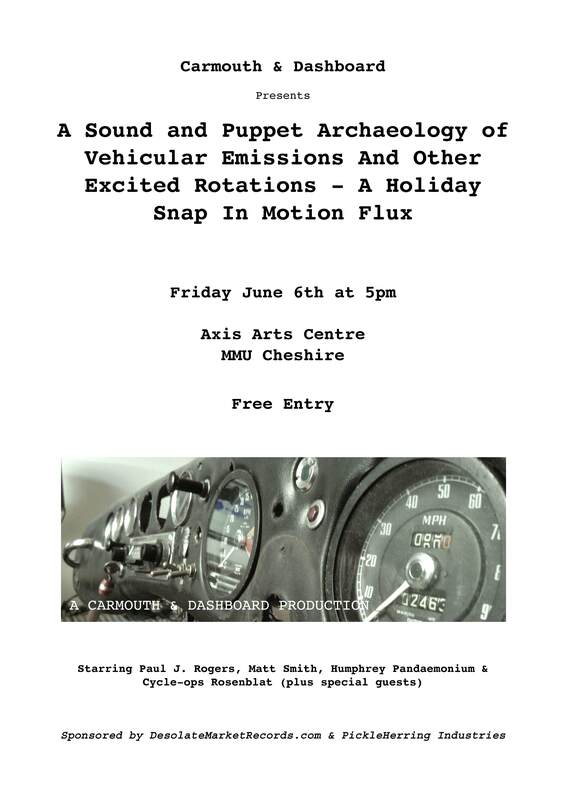 The performance starts at 5pm on Friday 6th June in Axis Arts Centre @ MMU Cheshire in Crewe. This entry was posted in Images, Live Performance, PickleHerring, Sound Installation and tagged junk, music, noise, performance, pollution, puppets on May 16, 2014 by afishywaltz. A few more images now added to the site…. and a page for PickleHerring… should be able to add some music up by PickleHerring soon too.. This entry was posted in General, PickleHerring and tagged PickleHerring on March 13, 2014 by afishywaltz.